Top access leveling feet with built-in level bubble. Precision ball and cup feet minimize side load impact. Tubular ribbed steel understructure for added strength. 1/4" thick diamond safety plate deck with lifting eye bolt. 200% overload protection. 20'L. stainless steel braided cable with quick disconnect. Stainless steel junction box 4X. LB/KG mode switching. Stainless steel swing mount stand for desk or wall mount. RS232 data interface. Tare to capacity. 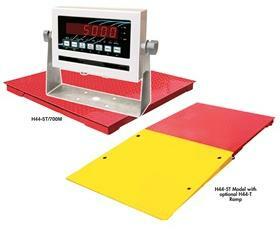 Scale and indicator are NTEP legal-for-trade. Factory calibration. Non-Slip powder coat finish in Red. FOB Shipping Point. 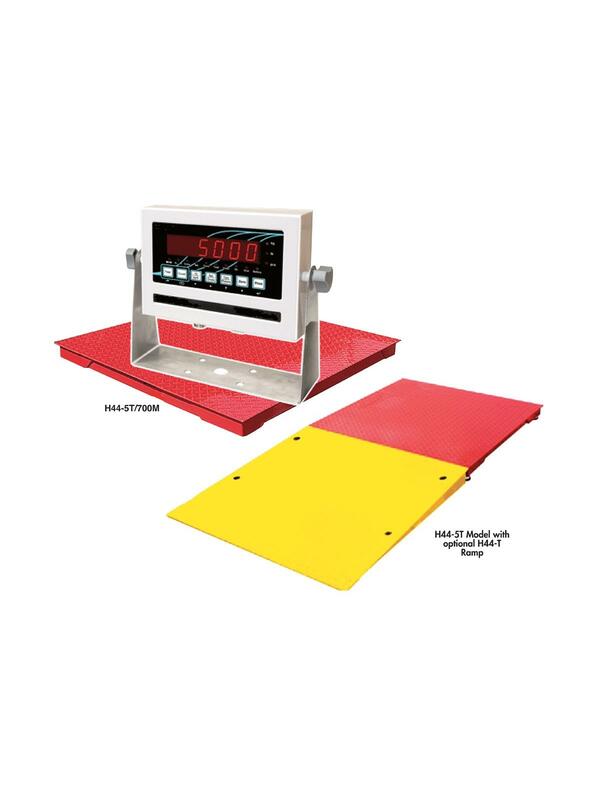 700 Series Low-Profile Touch Scale Series. NTEP Approved, Legal-For-Trade. Mild Steel Digital Display, AC Power Only, Bright LED Display. See Related Items tab for Ramps Bump Guards for Low-Profile Floor Scale (at least one optional ramp is required for Pallet Jack Access). Call for other capacities available. 10,000 lb. x 2 lb. 60 x 84 x 4-1/4"60 84 4-1/4"